People going to Brazilian churches these days have the opportunity not only to free themselves of the weight of their sins but also of their weapons and the risks entailed in their possession. In Brazil, civilians possess nearly 10 times the number of firearms as those held by state agencies. At the same time, the country tops world figures on the number of gun-related deaths each year. It may therefore come as no surprise that Brazilian churches are actively participating in a government-sponsored disarmament campaign aimed at the civil population. Since the end of last year, Brazilian churches have been mobilizing their local communities to open stands to receive weapons in parishes and other community centres. Weapons handed in are then turned over to the government's Voluntary Weapons Collection Campaign. Inaugurated on 15 July 2004, the aim of the official campaign is to collect weapons without asking "difficult" questions about their origin. Moreover, people turning in non registered firearms receive between 100 and 300 Reais (USD 40-120 / Euros 30-90) per weapon, depending on its type. The campaign was originally slated to conclude on 23 December 2004 and the aim was to collect 80,000 weapons. However, in November last year, a request that it continue throughout 2005 was submitted by the country's National Council of Christian Churches (CONIC), which brings together the Roman Catholic Church, the Evangelical Church of Lutheran Confession, as well as the Catholic Syrian Orthodox, Episcopal Anglican, Christian Reformed, Methodist and United Presbyterian churches. The request was presented to Vice President José Alencar Gomes da Silva during a meeting between him and the World Council of Churches general secretary, Rev. Dr Samuel Kobia, who was visiting the country at that time. "The population needs time to be informed and to decide," said CONIC in its petition. It promised that if the campaign was extended, "hundreds" of churches across the nation could become involved. Along with the ecumenical body, other civil society organizations also lobbied for more time. Six weeks after receiving CONIC's request, the government extended the campaign to 23 June 2005. The churches are now determined to make good on their promise. CONIC is working to bring the number of stands collecting weapons in churches to nearly 300 across the nation. With that goal, a team of facilitators is currently holding training workshops in the country's main cities. The reception points in churches operate on Saturdays in order to encourage people who are unable to come during the working week. Additionally, that kind of venue encourages those who are reluctant to approach a state agency to hand over their weapons. "Many people are more confident approaching a church than a police station," says Lutheran pastor Ervino Schmidt, secretary general of CONIC. This is partly due to the image that the population has of the police and to the fact that nine out of every ten guns turned in are illegal. Bishop Odilo Pedro Scherer, general secretary of the National (Catholic) Bishops' Conference of Brazil, estimates that the churches could collect over 100,000 weapons. The current official goal now stands at 400,000 weapons. According to the study "Brazil, the weapons and the victims" carried out by the Religious Studies Institute of Rio de Janeiro and the non-governmental organization Viva Rio, 15.5 million weapons in the country are in the hands of civilians. The figure is equal to 10 times the number of weapons in the hands of state agents. Of those, 8.7 million are illegal: they are in the hands of criminals or have been sold on the informal market and are not registered. 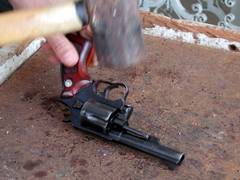 The study also determined that more than 38,000 people died in Brazil in 2002 from gun-related injuries. The figure includes the victims of homicide, suicide and accidents, and according to the study places Brazil in first place with the highest number of deaths from this cause in the world. There were 30,242 gun-related deaths in the USA in 2002. As well as churches, other organizations, like the Brazilian Bar Association, are participating in the campaign. Caravans for disarmament, television spots and advertising on public transport, flyers and street posters, free phone lines and even fasting days - anything goes when it comes to promoting the campaign. Its promoters are working to extend it to outlying areas and to the interior. And to focus on youth. "We know of young people in the outlying areas who want to turn in their weapons but are afraid, so we must reach them," says Valéria Velasco, coordinator of the Victims of Violence Committee. For some critics, the campaign disarms honest citizens and does not affect criminals. "This is a major misconception regarding its objective," says sociologist Antônio Rangel, from Viva Rio. The campaign seeks to "decrease the number of deaths from homicides among relatives, youth suicides and accidents". Accidents are responsible for one-third of all hospitalizations due to gun-related injuries. By removing the weapons from circulation, the campaign also ends up affecting criminals. Nearly 30 percent of weapons captured by the police were stolen or bought from honest citizens. "Whoever lets a weapon into their house has first let it enter their soul," says Fr Gabriele Cipriani. A Catholic priest and deputy secretary of CONIC, Cipriani synthesizes the particular contribution that Brazilian churches bring to the campaign: disarmament is a spiritual issue. "Turning over a weapon near a church can also be a religious act," says Scherer. It is "a moment of interior liberation", an opportunity to "manifest to God our aim to renounce violence". It is not just a question of reducing the number of weapons, but of building a culture of peace, says Schmidt. "Above all, we must disarm the spirits." A special prayer is available for the moment when the weapon is handed over. In the short as well as in the long term, the objectives of the CONIC churches are ambitious. For the short term, they are lobbying the government to extend the disarmament deadline to 23 December. In this way, they hope to increase significantly the impact of the campaign. They are also stepping up their efforts before a plebiscite slated to take place on 2 October. Mandated by national law, the public should vote on the proposal to ban the civilian trade of firearms in the country. With an energetic lobby in the National Congress and in the Justice Ministry, churches together with civil society organizations are trying to counter manoeuvres that seek to avoid or postpone the plebiscite. "Christian churches have adopted an active and committed position with civil society in the struggle against the weapons industry," says CONIC president and Bishop of the Methodist Church Adriel de Souza Maia. For him, ecumenism needs to take on the major causes of humanity. 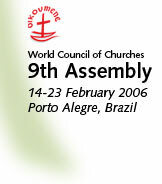 That is why he sees a strong link between the theme of the upcoming WCC 9th assembly in Porto Alegre in February 2006 and the disarmament campaign that the same churches which invited the assembly to Brazil are now involved in. "As we pray 'God, in your grace, transform the world', says de Souza Maia, "we are encouraged to work for concrete changes to overcome the paradigm of violence and death that small arms represent. The God-given gracious gift of life is the paradigm that leads us to action." (*) Juan Michel, WCC media relations officer, is a member of the Evangelical Church of the River Plate in Buenos Aires, Argentina.